This event has been months in the making and we’re so excited to finally announce the details of #WriteLikeAGirl2015! 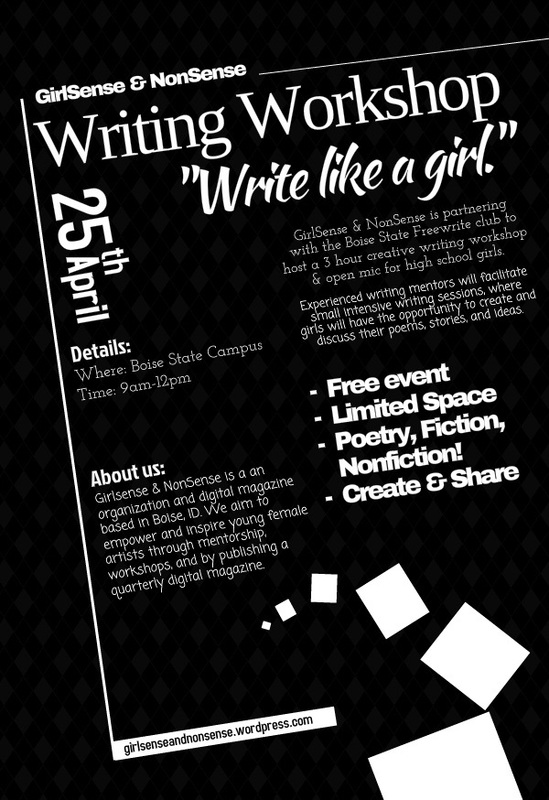 GirlSense & NonSense is partnering with the Boise State Freewrite Club and the Boise State English Department to host a one-day writing workshop for young writers on Saturday, April 25th from 9am-12pm. Female mentors will lead 5-6 participants in breakout sessions, where girls will spend two hours learning new writing skills and foundational elements specific to their genre. The mentors are women with a strong background in writing and working with emerging artists. We’ll be announcing who these wonderfully talented women are in the coming days. The next part of the workshop is optional but highly encouraged. We’ll take one hour to hold an open mic and hear the the stories and words crafted during the workshop. This is a fantastic opportunity for young writers to get direct feedback about their writing, to develop relationships, and hone their skills. Did I mention it’s free too? Use the hashtag #WriteLikeAGirl2015 to share your excitement on social media! We’re so excited to be able to do something like this in our community and are blown away by the support we’ve received in our community and at Boise State University. Thank you!